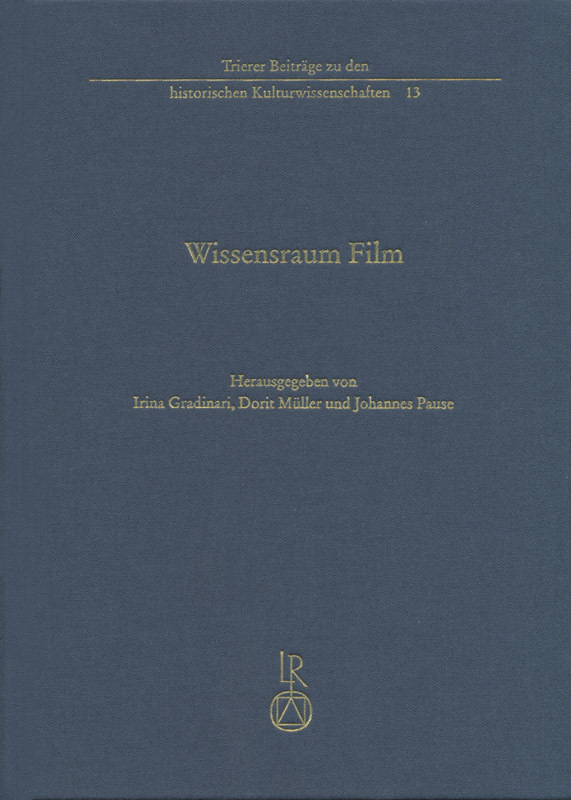 The present volume „Wissensraum Film“ („Film as Knowledge Space”) concentrates on two aspects: knowledge and spaces in film. Main focus lies on the relevance of a relational concept of space in analyzing filmic production of knowledge: How does film create spatial structures and thus specific formations of knowledge? The eleven articles describe and discuss on a theoretical level scientific, political, entertainment, and art film as well as documentaries with regard to their spatiality and epistemic effects. The films investigated are correlated with other types of media and non-filmic discourses. In recent years, film studies do not only investigate epistemological conditions but rather spatial aspects of film. Some studies have analyzed the order of discourses in film, practices of generating knowledge or the self-reflective knowledge of the medium. Others focus on spatial dimensions of filmic representation. There was little effort made to bring together the aspects mentioned. With this in mind, the present volume aims to explore for the first time filmic knowledge production with regard to filmic space. Our model „Wissensraum Film“ („Film as Knowledge Space”) considers film as medium generating, disseminating, and transforming knowledge. At the same time, it is conscious of the fact that knowledge, as produced in film, is always already spatially composed. Film, thus, has to create spatial relationships, dynamics, and transformations to be able to develop its knowledge. The overarching question of the volume is concerned with the productivity of relational concepts of space in the investigation of knowledge generation: How does film create spatial structures and thus specific formations of knowledge? What is the relationship between individual epistemic elements? How do spatial conditions of screening influence filmic representation and how does self-reflective knowledge evolve in this process? The volume investigates film as specific epistemic medium. Knowledge in film is not only confined to representing, interpreting, or transferring literary and scientific knowledge, just as the filmic space is not equal to Euclidean space in physics. Rather, there are multiple spatial and epistemic potentials exclusive to film in the different stages of its development. The contributions to this volume design models of describing this specific filmic mediality. They trace various genres, ouvres and aesthetics to determine their epistemic effects and correlate films with other types of media and non-filmic discourses. Irina Gradinari is research fellow at the Institut für Kulturwissenschaft (Institute for Cultural History and Theory) at Humboldt-Universität Berlin. From 2010-2013 she worked as an assistant fellow at the German Department at University Trier. Her current research project aims to investigate memory politics in West/East German as well as Russian war films on the Second World War. Selected publications: I. G.: Genre, Gender und Lustmord. Mörderische Geschlechterfantasien in der deutschsprachigen Gegenwartsprosa, Bielefeld 2011; I. G. et al. (eds. ): Geschlechter-Szene. Repräsentation von Gender in Literatur, Film, Performance und Theater, Freiburg 2010; I. G. et al. (eds. ): Texturen – Identitäten – Theorien. Wortmeldungen aus der jungen Slavistik, Potsdam 2011; I. G. et al. (eds. ): Verbrechen – Fiktion – Vermarktung. Gewalt in den zeitgenössischen slavischen Literaturen, Potsdam 2013. Dorit Müller is research fellow with the Emmy Noether Research Group Bauformen der Imagination. Literatur und Architektur in der Moderne (Building Formations of Imagination. Literature and Architecture in Modernity) at Freie Universität Berlin. From 2011-2013 she worked as postdoctoral fellow at the Research Center for Historical and Cultural Studies at Trier University. She is currently investigating architectures of knowledge in literature and visual media using historical examples of Arctic research and polar fiction. D. M./Boden, Petra (eds. ): Populäres Wissen im medialen Wandel, Berlin 2009; D. M./Scholz, Sebastian (eds. ): Raum, Wissen, Medien. Zur raumtheoretischen Reformulierung des Medienbegriffs, Bielefeld 2012; D. M./Weber, Julia (eds. ): Die Räume der Literatur. Exemplarische Zugänge zu Kafkas Erzählung „Der Bau“, Berlin 2013. Johannes Pause is research fellow with the ERC-Project „The Principle of Disruption“ at Technical University of Dresden. From 2009-2014 he worked as postdoctoral fellow at the Research Center for Historical and Cultural Studies at Trier University. In his most recent project he is studying political cinema from the 1960s to the years 2000. Selected publications: J. P.: Texturen der Zeit. Zum Wandel ästhetischer Zeitkonzepte in der deutschsprachigen Gegenwartsliteratur, Köln 2012. J. P./ Nanz, Tobias (eds. ): Das Undenkbare filmen. Atomkrieg im Kino, Bielefeld 2013. The new publication series entitled “Trierer Beiträge zu den historischen Kulturwissenschaften” (Trier Papers in Historical Cultural Studies) aims at being a forum for papers in the area of Cultural Studies, which focus on historical and interdisciplinary research. In addition to essay collections and conference proceedings, the series also covers monographic studies as well as exhibition catalogues. The editor of the book series is the Executive Board of the “Historisch-Kulturwissenschaftliche Forschungszentrum” (HKFZ) Trier (Trier Historical Cultural Research Centre) at Trier University. The Research Centre is financed in line with the research initiative of Rhineland-Palatinate. The HKFZ’s current research topic is called “Räume des Wissens – Orte, Ordnungen, Oszillationen” (“Spaces of Knowledge – Places, Orders, Oscillations”). In collaboration with national and international partners, groups of linked projects work on this topic at Trier University.